On Saturday Andrew had a couple work projects to accomplish so I took the younger children to the park with Rachel, Josiah and Rebekah. We played and enjoyed the sunshine. Micah is growing! This morning he made it back to his original birth weight. I am very thankful for the help of family, friends, our pediatrician, chiropractor and lactation consultant. He is now mostly nursing, though I am thankful to be able to pump and supplement as needed. Back and forth to the bathroom, Braxton Hicks and exhaustion; this was my nightly routine for the last few weeks of my pregnancy. At 34 weeks I began my herbal supplements, vitamins, minerals and regular preparation for labor and delivery, but mentally I was not ready yet. I feel like it has been forever since I have written anytime on Our Full House. Things have been a little busy around here with the arrival of number 15, our little Micah Andrew on July 13, 2015! 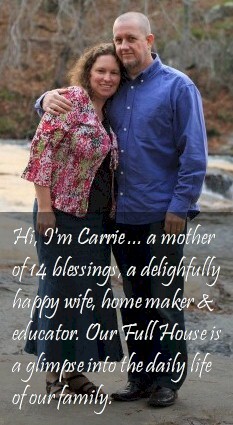 I continue to press ahead on all of the projects I am trying to accomplish before the baby makes his/her arrival.